In 1987, I have founded and run the Democratic School in Hadera, Israel, an experimental public school for four hundred schoolchildren age 4 to 18 years old. In a democratic school, each schoolchild builds his own personal study program and determines what to learn, how, when, where and with whom. The school is run democratically and all the teachers, students, and parents are welcome to be partners in the school’s management. With time, I have been involved in the foundation of similar schools both in Israel and worldwide and developed professional training, which is designed specifically for teachers in democratic schools. Increasingly I have started to lead processes in the spirit of the Democratic Education in hundreds of traditional schools and from there, launched the development of the Education Cities model, which goal is to transform the entire city into one big school. In Education Cities, the organization I am running today, we develop municipal collaborations between public institutions and private organizations that are active in the city, for the goal of expanding the unique development routes that are available for each student. As of today, we are active in more than 10 cities and towns, working with about 10% of Israeli schoolchildren, and the rate of our development is increasingly growing. Many times, I have been asked, why have I chosen to call the school in Hadera “Democratic?” Is it not that every school in a democratic society, a democratic school? I have named the school in Hadera “Democratic” because I realized that the old school model that had prepared students to life in the non-democratic society of more than a century ago, could not keep on existing and preparing kids for life in the democratic society in which we live today. Schools in the past, that had prepared their students for life as workers in an industrial factory, which mainly required discipline and obedience, cannot prepare them for life in contemporary organizations that call for creativity and for taking initiatives. I have realized that democratic education is the missing piece in the bigger puzzle called a democratic state. The interface between an education system that prepares its students to a world that does not exist anymore, and the social technological reality that rapidly forms before our very eyes, is one of the causes for the “fracture” that triggers the development of “massive Tsunami waves” which explain some of the social-economic crises we have been recently witnessing. In this paper, which is written almost thirty years after I have set out on my journey as an entrepreneur in the education world, I will talk about the “Tsunami” waves and their consequences. I will also attempt to explain the mechanism that activates these waves. Concurrently, I will share insights from my journey in the process of implementing innovation in the public education system. Processes, which demand the change in the old educational paradigm, the Pyramid Paradigm and a shift to work in a new paradigm, the Network Paradigm which I call – EDUCATION 2.0 (similar to Web 2.0). Before we set out on this voyage, I wish to thank my friend, Sir Ken Robinson, for his important support in the process of writing this article. Sir Ken Robinson and I have lectured together in the 2010 AERO Conference in Portland Oregon, and since then, we have been holding stimulating conversations – an amazing source of inspiration for me. I also wish to thank Sheerly, my wife, who vigorously defends every letter in the process of accurately writing down the ideas. And to all my friends in Education Cities – it all begins with the discourse I hold with you. In recent years, we have been witnessing big changes in every aspect of life. In fact, many believe that these are merely first signs for much bigger changes, which rapidly approach us and are indicating on the revolution in all sections of society. John Hennessey, Stanford University President, has issued, in the summer of 2012, a “Tsunami” Warning in the New York Times. Hennessey was referring to the “Tsunami” that is about to change the world of higher education as we know it today (mainly in light of the development of MOOC). Nonetheless, many other parties around the world have started to use the same metaphor to explain the social-economic situation in the world today – in other words, the “Tsunami” poses a threat to all the various aspects in our lives (and not only to higher education). many years. Therefore, the strike that had been sustained by professionals was also gradual. In contrast, today, many lines of work undergo revolutionary and rapid changes, and every change of this type generates loss of many jobs in a very short period of time. This begs the question; in what stage of the “social-economic Tsunami” are we? 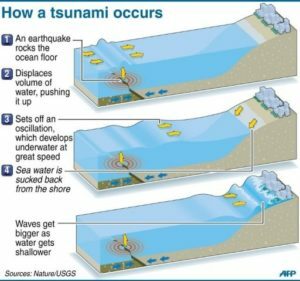 In some places in the world, the “Tsunami” is in the fourth stage – a receding shoreline – and attempts are made to protect the existing status by use of tools that worked well in the past but no longer work in the present. For instance, an excess of exams that flood some of the education systems as an attempt to protect them from the emerging changes. In other places, the “Tsunami” is already in the fifth stage and the tidal wave is beginning to wash the shore. See, for instance, the expansion of the “Lost Generation” effect – young people who followed the “right academic track” that promised them success in life, and found themselves without a job and with no future. These young people realize today that the education system did a wonderful work in preparing them for “life in the past” but not for life in the present and most certainly not for the future. Another example is the city of Detroit, USA, which filed for bankruptcy in July 18, 2013. Detroit, a city of two million residents, used to be the US capital of the automobile industry. The Tsunami that hit Detroit was in the form of the relocation of most of this industry to the Far East and the replacement of thousands of workers by robots and lean work crews. Tsunami waves are driven by a force labeled by Professor Clayton M. Christensen as Disruptive Innovation. These two processes essentially drive global innovation. For instance, the development of digital photography caused the extinction of film-based photography, a lengthy and costly process that required special development laboratories. Today’s photography is instant, accessible and free. Another example is connecting by telephone, which became dynamic (available from anywhere) and free. There are numerous imminent innovations, such as the autonomous cars revolution, which will eliminate the need for drivers, or the 3D printing revolution. In essence, the two characteristics of the Disruptive Innovation are ubiquitous, these days, in every aspect of our lives (transportation, energy, medicine, agriculture, communication, and more) in the form of accelerated technological developments, which have produced and will produce in the near future a massively long chain of social changes the nature of which has awakened a debate. Indeed, as aforementioned, we are facing a new era. And if changes in the past had been gradually introduced, today they have been accelerated. The Tsunami waves will become a routine event in our lives. Jaron Lanier – One of the leading people in the global hi-tech industry and a pioneer in the field of virtual reality, who believes that technological innovation will produce the collapse of the giant pyramids followed by a severe strike to the middle class. In contrast, Peter Diamandis, founder, partner and chair of Singularity University, and founder and chair of X PRIZE, believes that we are on the verge of an unparalleled era of abundance (Abundance is our Future) in mankind’s history, and that the overflowing online creativity will solve all the major problems faced by the world today. If we wish to know how to deal with the “Tsunami waves,” we must first understand their movement: where do they originate and in which direction they are headed. If we can answer these questions, we would be able to build tools for predicting the tracks of the Tsunami waves – towards which shorelines they are headed; what is the expected force of the waves; and how can we minimize the destruction and predominantly how can we enhance the opportunities they carry with them. The Agrarian Wave – in this period, most of the population had made a living from work in agriculture. The Industrial Wave – in this period, most of the population had made a living from work in industry. 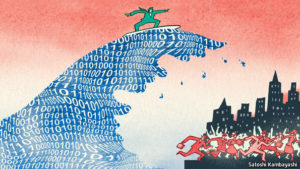 And the Information Wave – in this period, most of the population makes a living from work in the field of information. Nowadays, a forth wave is emerging from the Information Wave, the Knowledge Wave, which is currently in its early stages of development. At its peak, in the future, most of the world’s population will make a living from creating new knowledge. Is this situation possible? Are all people sufficiently creative to produce new knowledge? How can we even imagine that what was once the fortune of a few exceptionally creative geniuses – an extremely rare group in the population – will become universal? In our old familiar world, this kind of phenomenon is, indeed, inconceivable. However, our old familiar world is about to change completely as a result of the emergence of the Knowledge Wave. The fundamental change will be expressed in the creation of a new labor paradigm – if during the industrial wave and at the beginning of the information wave, people worked in pyramid-like* organizational structures, in which ideas traveled mainly in a top- down direction; nowadays, more and more of the work takes place in network* structures, organizations in which every member is both a developer/producer and a consumer (Alvin Toffler calls this a Prosumer– a consumer who is also a producer). Dr. Moisés Naím explains this as a colossal phenomenon of collapse of the old centers of power. * Explanation on network and pyramid will be presented later in this article. Jaron Lanier is right then – if the majority of humankind continues to live in social economic systems that work in the old pyramid paradigm, the collapse of these pyramids will result in a severe blow to massive segments of the population. In similar vein, Todd Rose describes the future, in his book: Average is over, as a world of extreme ends (15% of the population will be rich and the rest will be poor). All the same, Peter Diamandis is also right – Individuals who will work within the framework of social and economic networks will experience a world of abundance (I believe that Lanier agrees with this assertion too), provided that most of the population would be able to work in a network setting. Hence, is it possible that most of humankind will start to work in knowledge producing networks? In order to understand the transition from a pyramid paradigm to a network paradigm, we must first familiarize ourselves with the structure of a “pyramid cell” and a “network cell” (a model I have built when working on development of education systems). Then we can try to shed light on what are the conditions that will facilitate the emergence of this change. A pyramid cell is a “transfer cell” and it is a hollow cell. Its function is to receive information from “above” and to transfer this information “down”. The pyramid cell is hollow because its function is transfer. It is prohibited from intervening and changing the “information” that passes through it, and of course, it is prohibited from giving it a unique color or an independent thought. It must perform a “transfer” task only (hence its tremendous usefulness during the Information Wave, when the main task was transfer of information in a downward flow). The pyramid cell represents a single component in the society – a person or an organization (group). Everyone is in a competition – the goal is to move upwards to a higher level, to reach the uppermost levels, where the power, success, and influence are centered. Ideas flow in a top-down direction. The role determines the individual’s status (the cell). Why do pyramid organizations fail to survive the Tsunami waves of innovation? In order to survive, an organization must rapidly adopt or generate new ideas. The success of such a change leads to the realization of the organization’s goals in simpler and more cost effective ways (as previously mentioned these are the two components of innovation). A Pyramid Organization is essentially a “preserving organization” which has difficulty with rapid changes. Innovations, by nature, are more prone to failure than familiar ways. The decisions to set out to new experiments require a long process of authorizations. Typically, these authorizations are issued by people who are located in the upper levels of the pyramid and whose main concern is preserving things as they are. Innovative ideas that form in the lower levels of the pyramid sluggishly work their way up, to avoid inflicting damage to the “authorizing” level and also due to the long time which is required to find the “safe way” to implement them. The “safe way” enables giving credit to the “authorizing” party in case of success and steering clear from harming it in case of failure. Moreover, ideas that are introduced from outside of the pyramid will, most likely, be ignored, out of the belief that everyone who is outside of the pyramid falls under the category of competition. Thus, when the pyramid paradigm is employed in a group/organization the basic assumption is that each cell is hollow/empty, and the central question that is asked is with what should the cell be filled? In this way, a cell that has been filled for instance with “blue color”, would transfer the “blue” to all the hollow cells below it. Ordinarily, in the old education field, the administrative people ask themselves, what knowledge does heads of teachers and teachers lack? And the teachers, later transfer the information they have received to the students. The principal question is how to transfer the information in the most efficient method, and in such way that will guarantee that most of it will reach/fill the “empty students”. None assumes, at any level, that perhaps there are heads of teachers/teachers or students who already have knowledge that may assist and may make the educational/learning journey more effective. The function of a network cell is to serve as a “creation cell” as oppose to a “transfer cell.” The goal of a network cell is to generate new knowledge. It has a “unique color” – a color it developed for itself. Every piece of information that reaches the cell (from different directions) is influenced by the cell’s unique color. It receives information from every direction (learning from colleagues, supervisors, and students). It transfers information to every direction. When we talk about finding a “unique color,” we refer to the process by which each individual or organization finds its “element,” as described in Sir. Ken Robinson’s book. In other words, finding the place where our unique talent merges with our passion is an essential prerequisite for the development of a network system. One may conceptualize a single network cell as “potential energy”. When two network cells come into contact, each cell transfers to the other “its unique color” and by which, the potential energy turns into kinetic energy, or in other words, to energy that forms during movement. In the same way as in physics, the greater the weight and velocity of the cell, the greater the energy formed. The 17th century philosopher, Gottfried Wilhelm von Leibniz, called this Vis Viva (Latin for “living force”). Hence, at the heart of the paradigm change rests the distinction between life and the machine. The pyramid works as one big machine whose members are parts subject to its rules. On the other hand, the network organization works like a living organism whose members, in accordance with Leibniz’s theory, nourish and develop from the energetic exchange between them. They have internal creation powers that are independent of the demands of their “supervisors.” A network organization is one that perceives each individual’s uniqueness and the development of collaborations, as a great opportunity for the advancement of the organization. When a “living organization” comes across the Tsunami waves of social ideas, instead of destroying it, the waves’ simplicity and the economic capacitation, expand the organization’s choices for expression and for cooperation between its members, providing opportunities for generation of new ideas and of groundbreaking initiatives. When a number of “network cells” make contact with one another, a living, network-based organization, forms. Each member is encouraged to express his/her uniqueness. The organization invests resources and intentional effort in support and assistance to every member of the organization, in his quest for finding and expressing his uniqueness. The organization gradually develops collaborations between its members, for the goal of finding, defining, and expressing the “organizational element”, or the organization’s uniqueness. Pyramids can exist in a network-based organization; and networks can exist in pyramids. A network member may be located at the top of one pyramid and in the bottom of another. Why do pyramids collapse and networks grow nowadays? In a pyramid structure, people play machine roles (Charlie Chaplin’s film, “Modern Times” is a good example for this). The collapse of the pyramid stems from the emergence of a Disruptive Innovation in the form of a computer, a robot, a 3D printer, which ultimately takes the place of the “human robot” and sets free the “creative man,” an individual whose renewing field of activity is embedded in networks of collaborations comprised of creators like himself. In other words, humanization is the force that drives the collapse of the pyramid as well as the networks’ development. The big question is whether and how will the transition between the two paradigms be successful for the majority of humankind, and how will it not result in an increase instead of reduction in social disparities. After examining the structure of pyramids and networks, we now can revisit Lanier’s and Diamandis’ prophecies. Both scenarios (the destruction and the abundance) are plausible, and the choice between the two is in our hands. Like Jaron Lanier, I too believe that the Tsunami will forcefully strike all the pyramid’s workers – as we are living in the era of the “collapsing pyramids.” However, at the same time, we have the answer – the emergence of network-based organizations. These types of organizations are not only “Tsunami proof” (simply because robots cannot replace the force of human creativity), the network-based organizations know how to utilize the new ideas that develop around the Information Wave in such way that would enable us to surf these waves and reach new horizons of abundance for mankind. What we must do today is to allow individuals and groups to build network-based organizations. At the same time, if the old pyramid organizations wish to continue living, they too must start developing networks inside and all around the organization. To amplify the rate in which networks are created, the education system has to change its course – it must cease to prepare its students to life in collapsing pyramids, and instead start preparing them to life in the new era, the knowledge era. How will the new education 2.0 system that works according to the network paradigm, look like? Educators and education organizations around the world are generating numerous answers, which will increasingly expand and grow in number. The media, which is becoming simpler and accessible to all, creates networks of global innovative educators who generate, right here and right before our eyes, new educational models in the network paradigm. In this part of the article, I will attempt to illustrate what form these solutions take these days – in the classroom, in school, in the city, in the state, and in the world. In the old pyramid classroom, the teacher’s starting point was that kids enter the classroom empty/hollow, and the main question was with what to fill them up and how to do so. The network classroom has a new starting point, according to which, they are in a quest for discovering their unique “color”, and therefore they bring with them to the classroom a rainbow of various colors. When faced with this starting point, the classroom transforms into a creativity team, in which teachers and students set out on a shared journey of exploration. In this journey, they tackle, hand in hand, challenges in various areas of knowledge, challenges that are relevant to the world in which we live today. From a model of one teacher and a group of students, the classroom transforms into a learning community in which everyone is both a teacher and a student. Various teams comprised of students, teachers, and community experts, work together in the classroom on shared challenges. The teacher’s role is to support the development of a learning and creating community, in which the individual is appreciated and is encouraged to find his/her “element” and to see and help his/her classmates in their journey as well. Every student specializes in his/her area of strength by utilizing the vast sources that are available to him/her. In classroom 2.0, peer-assisted learning takes place (the most profound type of learning). Peer-assisted learning utilizes the student’s diverse areas of strength. There are various models of network learning. One of them is a unique model that we have developed in Israel (by Education Cities) – The Education Team (or Classroom 2.0). Every student is also a teacher – The teacher in his new role as the Education Team’s Coach is striving to assist every student in finding his/her area of strength. The student becomes a “young teacher” in this area. The classroom has a measurable shared challenge – The challenge may be academic, social or community based. The innovation is that the challenge is shared among the entire classroom rather than an individual challenge. For instance, in an academic challenge, the group’s grade is the average score of all the individual grades of the group’s participants. The entire classroom takes part in the generation and implementation of ideas for improving the classroom’s grade by peer-assisted learning and by utilizing areas of strength. After nearly 5 years of operating the program, during which we have developed methodologies for classroom work, we are witnessing a great deal of success in every dimension. The Education Team Model successfully interweaves academic achievements with joy of learning. And where we have previously witnessed rivalry and competitiveness, we now see Arvut Haddadit (Hebrew term for “mutual responsibility”). In the pyramid school – The system’s starting point is that the teacher is “hollow”, and therefore the system is preoccupied with instructing the teacher what he/she needs to do while narrowing down the teacher’s judgment in outlining the study program, predominantly in time management. The teacher is a “lone ranger” who attempts to be successful in his/her main educational task – to “transfer” study materials in classroom. The teachers are the leaders of a school-wide learning community. In the first step – Teachers are encouraged and supported in initiating projects that fascinate them. In the second step – Networks of teachers begin to form. These networks work in cooperation and lead learning and communal initiatives in school. In the third step – Students and their parents are encouraged to take part in leading and developing the initiatives. In a pyramid city – most of the organizations are in competition with other similar organizations on the one hand, and alienate themselves from different organizations on the other. The old school perceives other schools that are active in the city as competitors in the race for limited resources, and every other organization in the city is “invisible” to it. An Education City perceives the education system as an essential tool in a citywide development, and the city as an essential tool in the education system’s development. The city as one big school – an Education City is an educational social network focused on the realization and development of the individual and the municipality via individual, community and municipal areas of strength and growth. Local Narrative and Local Language – An Education City develops a local “narrative”, a local “language”, and a local way of life that are based on local areas of strength and leverage future avenues of development. In the pyramid paradigm, every city works independently and perceives other cities as its competitors. In contrast, according to the network approach, a sense of mutual responsibility and trust forms between the different cities, and different collaborations form, the type of which enables each city to express its unique color. The work with other cities facilitates the development of networks of “agents of educational breakthroughs”, who often feel isolated in their source communities, and who are now connecting with nationwide networks of learning and support. Everything that transpires in classrooms, schools, cities, and states, will shape the future of our world. The DNA of collaboration and mutual responsibility works equally well in a game between two six-year old kids as it does in regional collaboration between two countries. Accordingly, the network approach, which advocates the promotion of the organizational goals concurrently with the acknowledgment of the individual, is too, translated globally to worldwide collaborations hand in hand with the acknowledgment and appreciation of the local way of life and with sustaining the uniqueness of every people and region. Global collaborations enable teachers from all over the world to feel that they are vital partners in the development of the new network-based education, an education which is said to lead the world into a new era of abundance. In the past, the education system gave out fish – transferred knowledge. In present days, the education system is giving out fishing poles – teaching students how to study on their own. In the future, teachers and students should go out to fish together – developing learning and creating communities that will embark together on the journey for Tikun Olam (Hebrew term for making the world a better place).